Senior transfer Nigel Johnson talks with AFP editor Chris Graham and reporters at UVA basketball media day. Johnson, a 6’1″, 182-pound guard, is a graduate transfer from Rutgers, where he averaged 11.3 points per game in 2016-2017. An explosive scorer, Johnson had five 20-point games last season, including in both Rutgers games in the Big Ten Tournament. Before playing at Rutgers, Johnson played two seasons at Kansas State. 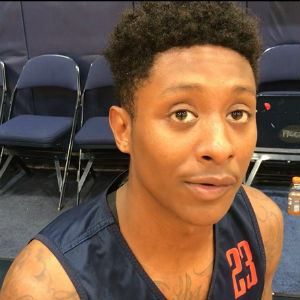 He is expected to get time in the backcourt rotation at each of the three guard spots for the ‘Hoos this season.